To use the center cup holder, pull down the armrest and press the open button. 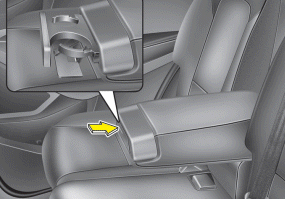 Do not place uncovered cups of hot liquid in the cup holder while the vehicle is in motion. If the hot liquid spills, you may burn yourself. Such a burn to the driver could lead to loss of control of the vehicle. Keep cans or bottles out of direct sun light and do not put them in a vehicle that is heated up. It may explode. 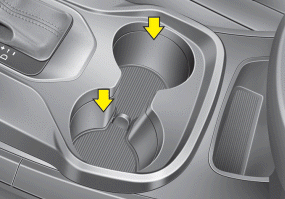 When cleaning spilled liquids, do not dry the cup holder at high temperatures. This may damage the chrome part of the cup holder.